106 years Old Woman and Indian Granny Mastanamma has become World’s oldest YouTuber from Gudivada, Andhra Pradesh. She proved that talent finds the way and age is not an important factor. She runs a YouTube channel named Country Foods got millions of views from Worldwide. Her recipes created the storm on YouTube and became a YouTube cooking sensation.106 years old granny now became a famous personality on the Internet. As if she doesn’t understand how much popularity she got, but she has become the World’s best Indian Cook. We must appreciate her proficiency with cooking, she got the unique style of cooking, recipes prepare in shells of fruits like watermelon, pumpkin, bamboo sticks, Coconut shells and some leaves instead of bowls. YouTube is the best platform to showcase their individual talents to upload videos around the world. YouTube also changed its strategy to showcase their talents and a marketing platform pays for a number of view count. Indian Granny Mastanamma recipes seafood is her speciality like Crabs, Prawns and 7kgs Big fish fry with banana leaf. She grabbed food lovers attention by exhibiting her skills preparing delicious recipes in Indian traditional style. Country Foods Channel run by her great grandson K Lakshman and his friend Srinath Reddy. They are video editors and foodies, they identified the Mastanamma cooking talent. Her Grandson and family celebrated Mastanamma 106th birthday in Grannies village. The Villagers share few words about Mastanamma “ she is the very nice person, does not depend on anybody, not even on her son also.Still, cooks herself does not take rest in home and spends her time in paddy fields”. Her grandson Lakshman said how they started this YouTube Channel “One day we prepares fried rice in a room with his friend, we had shooted everything and uploaded on YouTube just for fun. Surprisingly we got many views for that video, at that time got an idea of starting a YouTube to share traditional recipes with fresh foods with the help of my grandmother Mastanamma. Stating she did not understand what is going on, while we are filming the videos. After That, she realised felt very happy. She was a typically an Indian Grandmother cares and shows affection for everybody to share food. She shares her old memories and stories to views while cooking in her videos. She specialise with her recipes compared to other recipes like Traditional Mutton Biryani, KFC Style village Chicken, Drumsticks gravy with Pulao, Emu egg omelette, Egg Idly, Brinjal Curry, etc. Granny’s channel got more than 261,220+ subscribers and 47,210,753+ views. 106 years old Indian Granny Mastanamma proved, it is not too late to become a famous personality to start at any time if you have a willpower. 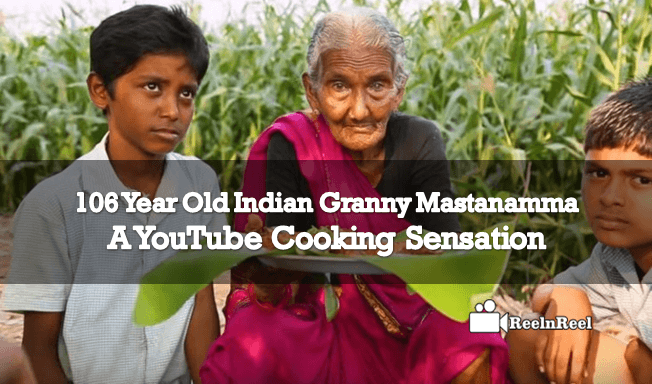 Mastanamma became India’s first oldest YouTuber, best tradition Cook, and YouTube Sensation in the World.